MUMBAI, India, August 9, 2011 (ENS) – About half a ton of oil is leaking every hour from a sunken cargo vessel off India’s west coast and traces of oil have been observed up to 12 nautical miles from the site, India’s Directorate General of Shipping said today. The cargo ship MV Rak began to spill fuel oil on the night of August 6 after sinking August 4 about 20 nautical miles off the city of Mumbai, a city of 20 million people, the capital of Maharashtra state. The 30 crew members onboard from Jordan, Indonesia and Romania were rescued by Indian Defence Forces before the ship sank. On Saturday, the Mumbai police arrested the ship’s captain, Arkan Abdul Khalil Yunus, 36, a Jordanian, and chief engineer Ioneseu Ion, 54, a Romanian. They and they ship’s owner were charged with endangering the life or personal safety of others, and with crimes under the Environment Protection Act and the Prevention and Control of Water Pollution Act and released on bail. “According to estimates, so far, 70 to 100 tons of oil has leaked,” said Inspector General SPS Basra, Commander of the Coast Guard, Western Region, on Monday. The flow of oil from the ship has been reduced to about 10 tons per day from 35 to 40 tons per day when the spill started, said a statement late Tuesday from the Directorate General. The statement followed a meeting of officials from the Directorate General with the State Environment Department, Indian Coast Guard, Mercantile Marine Department, Mumbai, Mumbai Port, Maharashtra Maritime Board, Maharashtra State Pollution Control Board and salvage companies. The local protection and indemnity correspondent will mobilize resources to either seal the source of the leak or debunker the oil, the statement said. “The continuous trail of the oil leak from the vessel is observed up to 5 to 8 nautical miles as compared to 12 nautical miles earlier,” said the Directorate General. Dispersants are being used to neutralize the oil spill, which is approaching Mumbai. 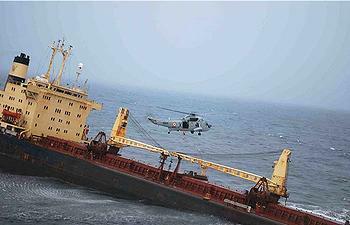 Coast Guard officers on fly-overs spotted oil patches seven nautical miles off Mumbai harbor on Monday. They observed tar balls in the mouth of an estuary close to Alibag Beach, a well-known tourist spot, and patches close to Dadar beach and Bandra Bandstand. But the Coast Guard officials dismissed discoloration observed on Alibag Beach, which they said is “the usual phenomena” during the monsoon months. A State Oil Pollution Board representative said that no fresh oil deposits have been noticed on Juhu and Versova beaches. Three Coast Guard vessels, including an oil pollution response vessel, are on the scene to deal with the oil spilling from the sunken ship. 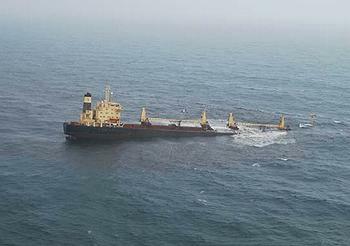 The Port of Mumbai is issuing navigational warnings over the VHF advising mariners of the sunken ship’s location. The Regional Centre of National Institute of Oceanography, Mumbai is regularly collecting water samples to assess the impact of the oil spill. The fishermen’s union of Mumbai on Saturday demanded a judicial probe into this and other recent ship sinkings. The same area was hit with another oil spill with the sinking of the MSC Chitra in 2010. The fishermen asked that 10 percent of the insurance money claimed by the owners of the MV Rak must be used for cleaning up environment.